Considering the occupants—fledgling companies ranging from COSY, a spinoff from Penn’s General Robotics, Automation, Sensing and Perception (GRASP) Lab that’s developing technology to enable robots to navigate and manage inventory in retail stores, to Spor, a Kickstarter-funded firm that makes solar-powered battery chargers for USB devices—a pair of Penn-themed prop scissors was a fairly run-of-the-mill production. But the building, a onetime DuPont Company factory transformed by New York architecture firm HWKN into a vibrant, light-filled innovation hub, is anything but. The 58,000-square-foot 1960s-era concrete-frame structure, comprehensively overhauled and embellished with a dramatic glass facade whose crystalline projections gesture across the Schuylkill River toward Penn’s campus and Center City, contains four wet and dry laboratories comprising 30 bench seats, five garage-bay workspaces and four office suites for entrepreneurs, and a full-service business incubator—Penn Center for Innovation Ventures (PCI Ventures)—to help them grow. It also features more than 200 co-working desks, interspersed with common areas and collaborative spaces, for mobile professionals in Philadelphia’s growing market for flexible office arrangements. In addition to the maker-space machine shop, the building’s occupants will have access to shared laboratory facilities stocked with equipment, some of it donated by Merck & Co., one of several sponsors and corporate partners that include Qualcomm, which will pursue robotics research, and the Hershey Company, which will focus on innovation in food manufacturing. 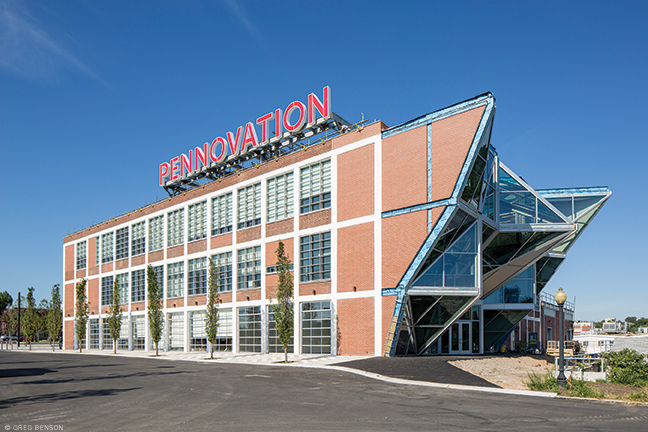 The building’s top floor houses PERCH—the Penn Engineering Research and Collaboration Hub, a robotics-centric research facility launched by the School of Engineering and Applied Science. The University hopes the building will foster connections between the academic and commercial realms, with an emphasis on attracting start-up companies that require more engineering and/or biotechnology infrastructure than they can afford on their own. Maggie Schmierer is the director of laboratory operations at CytoVas, an in vitro diagnostics company focusing on cardiovascular health, and one of the building’s inaugural occupants. “There are not very many affordable places” in the Philadelphia area, she said, “especially places that have the equipment and the ability to walk in the door, start a laboratory, and get it up and running in a week or two.” Her lab moved from the University Science Center, where “troubleshooting was often time-consuming,” she added. Papageorge noted that the Pennovation Works campus has a total development potential of 1.5 million square feet in existing buildings and empty parcels, of which only 250,000 square feet have been developed and occupied so far. “Our hope is that once you incubate here, you will graduate to another one of our buildings,” she said. 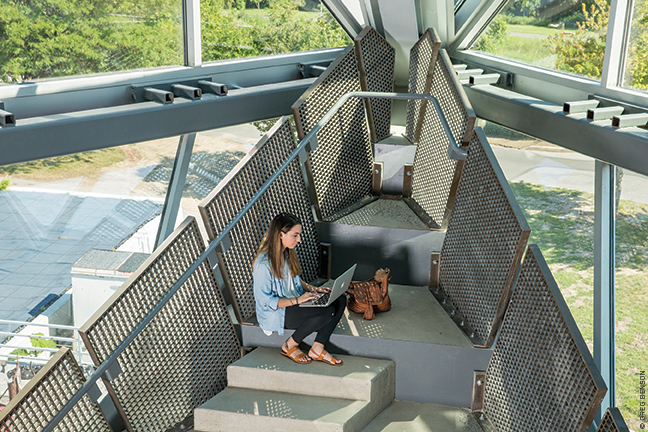 Daniel Koditschek, the Alfred Fitler Moore Professor of electrical and systems engineering and inaugural director of PERCH, raved about his sprawling upper floor, which was a hive of student and faculty activity in early October. He said that his robotics colleagues were “desperate” for such a facility, which includes a netted outdoor area the size of a basketball-court particularly well-suited to testing flying robots. PCI Ventures, which has permanent space in the building, has helped to start 140 companies over the last six years, 65 of which are still going concerns, said director Michael Poisel GEng’92 WG’97. “We’ve had three exits,” he said, referring to equity buy-outs, “and we’ve returned to Penn well over 10 times the investment they’ve made in this program.